A patio roof or an overhead may be attached to the house with a ledger, as shown at right, or it can be freestanding, as shown below. In either case, the structure is supported by a series of posts or columns, which in turn rest on a concrete slab or on piers and footings. If you’re adding an overhead to an existing deck, you can bolt the posts to the substructure of the deck, placing them directly above or adjacent to the deck posts. The posts support beams and rafters. If the overhead is attached to the house, the ledger takes the place of a beam, supporting the rafters directly. Overhead rafters can be left open or can be covered with any one of a number of patio-roof materials. 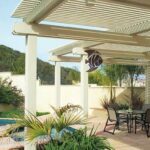 Several different styles of roofing are used on patio overheads and gazebos, from open latticework to wood shingles. 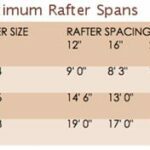 Installing open roofing such as lath or lattice panels is a relatively easy—though repetitive—job. Solid roof coverings intended to shed rain are more of a challenge, requiring a variety of basic roofing skills. Still others—glass, steel, built-up, and tile—are best left to professionals. The illustrations below show several types of patio roofs and two methods of building a gazebo roof—one with open sheathing, the other with solid sheathing. The gazebo-roof construction can just as easily be used on a patio roof.